Break into Lord Eradikus' ship and steal his secrets. Just don't make too much noise. The original Clank! sent us on a dungeon dive into a dragon’s perilous cave. 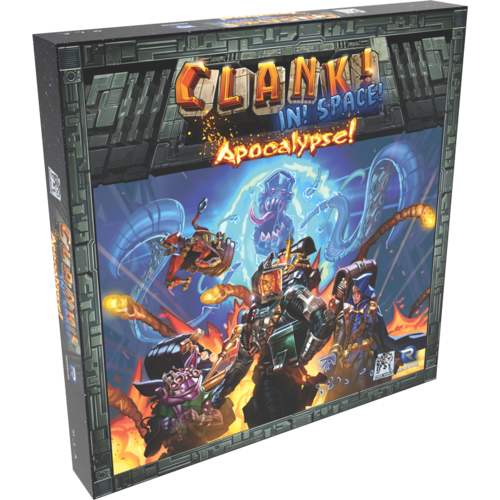 Renegade Games’ follow-up, Clank! 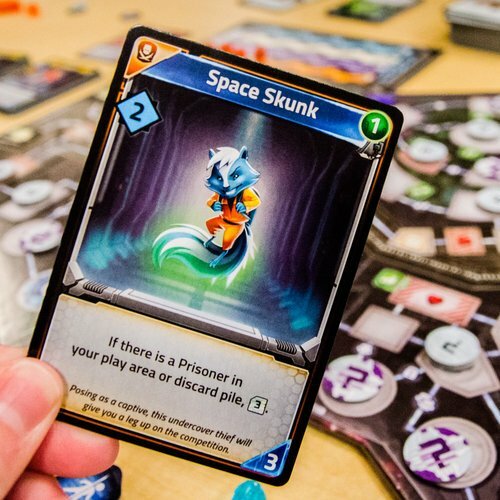 In Space (MSRP $60), takes everything that was great about the deckbuilder-meets-board game and pits players against an evil alien overlord. In Clank! In Space, you’ll be using a deck of cards to move through Lord Eradikus’ ship, hack a force field protecting his command module, steal one of his artifacts, and get back to the start to jet away in an escape pod. 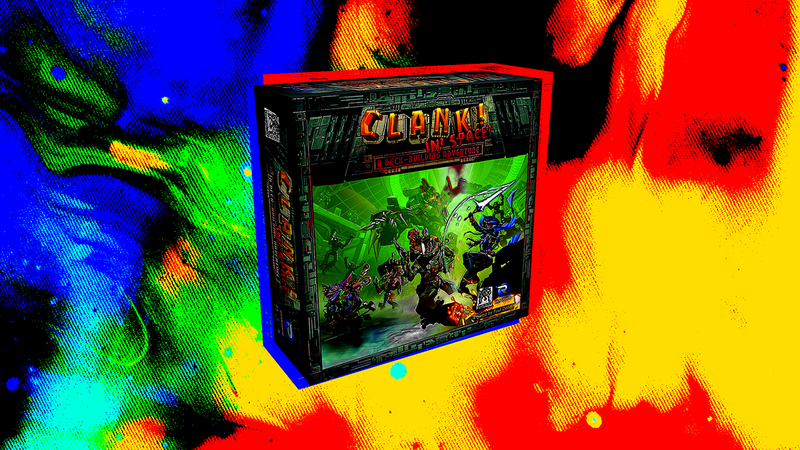 All the while, you’ll be generating the titular “Clank!” which draws Eradikus’ attention. Draw his ire and suffer too much damage, and you’ll perish (possibly losing all your points). But is Renegade’s tongue-in-cheek space race right for you and your family? Boldly go find out below. Who is Clank! In Space appropriate for? We had no problem playing with our son, who is a seven-year-old advanced reader. This isn’t his (or our) first deck-builder, though. Clank! and Clank! In Space are rules heavy up front, but require very little rule reference later in the game. After the first play, you likely won’t need to reference much (outside of the different setup rules for different player counts). The game scales well for two players (the minimum) all the way up to four (the maximum). What is a deckbuilding game? In 2008, Rio Games published Donald X Vaccarino’s Dominion, launching a new genre of tabletop games. Deck builders start players with identical starting cards (often 10 to 12). In most of these, you play all your cards during your turn, purchase new cards from a common “market,” discard, and draw a new hand. When you can’t draw anymore cards, you shuffle your discard pile (including any cards you’ve purchased) to refresh your deck. Over time, your deck grows significantly with strategic additions that complement other cards you’ve added during the game. Most of these games rely on scoring victory points at the end to determine the winner. Since Dominion’s release, the “deck building” genre has exploded with both competitive and cooperative offerings, becoming a common landing pad for pop culture licenses, including Marvel super heroes, Harry Potter, Alien, and more. What sets Clank! In Space apart? Clank! In Space belongs in a branch of deckbuilding games that also has a critical board component. The modular tiles create different ship layouts, which means that there are multiple variations that will keep future playthroughs fresh. The big difference between the Clank! series and other deckbuilders is the addition of movement throughout a map. Cards you play during your turn contribute to one of three instant currencies: skill (for buying additional cards), laser swords (for attacking enemies on the board or that appear on the map), and boots (for movement). If you aren’t careful spending your skill each turn to add cards to your deck, you could find yourself at a loss for boots or laser swords. This could cause you problems later, but is easily remedied thanks to two piles of cards that are always available in the market. One gives you skill and a boot. The other gives you skill and two swords. Clank! In Space also smartly pushes players to move quickly and explore most of the ship. The first thing each player must do is hack two different data terminals. These give you a one-time bonus or penalty, and you need to hack two to access the command module where the all-important artifacts are located. However, you can only hack one terminal in a module. Only three modules (the ones you can swap around in each game) have terminals. That prevents a beeline right to the artifacts and forces players to strategically plan movement. Lord Eradikus is watching players, and there are a number of things he’ll do during the game. Every time you generate a Clank! cube, it goes to a pool on the board. When players purchase cards from the market, the offerings need to be replenished. Some of the cards have a “boss” icon on them. That triggers an attack. Any Clank! cubes on the board get added to the boss bag, and a number get pulled based on the current boss level. Black cubes are misses. They get removed from the bag permanently (unless a card instructs you to return them). Colored cubes signify a player of the matching color getting hit and losing a health point. When a player snags an artifact from the command module, the boss level increases. The same thing happens when a player hacks two terminals or draws one of the “archive” hidden tokens on the board. Every time the boss level increases, there’s a chance that more Clank! will get pulled during every attack. At higher levels, bounty hunters will be dispatched. When those get drawn from the bag, every player takes a hit. At the second-highest level, a barricade goes up to block off one of the faster routes back to the exit. Every time a player either dies or escapes from the ship, their turn is replaced by a boss attack. This rapidly brings the game to a close as players either quickly follow out in one of the remaining escape pods or die. If you make it back to the cargo bay but don’t get out of the ship, you’ll still get to score your points (but you won’t have earned a crucial 20 from escaping). The player with the most points after everyone has escaped or perished wins. What about the Apocalypse expansion? The first expansion for Clank! In Space, Apocalypse (MSRP $25), adds two new module tiles, more adventure cards, and a new “scheme” mechanic that adds even more variety. In the base game, every black cube drawn from the boss bag during an attack is a sigh of relief. In Apocalypse, there’s a downside. Every scheme has three phases marked by a number of cube slots. Each black cube drawn is placed on the scheme card. When a row is filled, the phase effect triggers. These include removing components from the game, altering card effects, or slowing players down. Every scheme also has a way for players to remove a black cube from an active phase once per turn. This additional layer of cooperative management creates interesting interactions at the table. Players were constantly reminding each other about paying to remove black cubes, creating challenging decisions: should I prioritize my own run to the artifacts, or should I spend valuable resources for the common good? 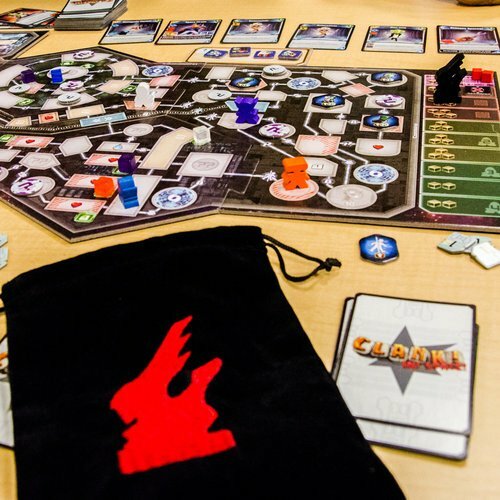 Ultimately, Apocalypse adds more variety, additional decisionmaking to keep things interesting, and a layer of flavor that makes each game feel more meaningful. Interested in a randomizer or solo mode? Renegade Games has a free app on iOS and Android that adds more ways to play. It’s worth downloading. I’ve loved Clank! since demoing it at PAX West 2016. Clank! In Space is fantastic with or without the Apocalypse expansion. Start with the base game. If you love it as much as I do, Apocalypse is an easy purchase decision. $25 for an expansion that revitalizes and refreshes a game you’ve played a bunch is absolutely worth it. 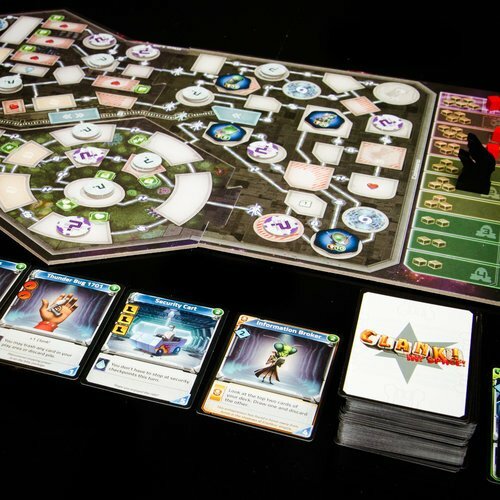 If you’ve never played a deckbuilding game, Clank! In Space might be a tougher place to start (unless you’re a seasoned board gamer in other regards). If you haven’t loved deckbuilders before, the Clank! series’ addition of a board might be enough to woo you. Clank! In Space has a permanent home in our collection, and I’m sure it will be back on the table soon.